As the majority of us have mobile phones, the issues of making personal calls at work have changed. It is no longer just about using your office telephone to make calls, as we are faced with ring tones, text messages and being contactable at all times. Please do be aware that even when you think you are talking quietly, in open plan offices, especially those where people tend to be working alone at their desks, your call is likely to be overheard. If you are able to wait until lunch or break time to make particularly personal calls – those of an emotional or medical nature, or calls that may get heated – it will be better than your colleagues knowing all your private details. This is true not only so they you are not gossiped about, but also because you may make your colleagues feel uncomfortable if they overhear your conversation. There are an infinite number of ring tones available now and what may sound like fun at home on a Saturday morning will sound silly and unprofessional if it rings in the middle of a project meeting. Just chose a plain ring, with your phone switched to silent or vibrate for meetings, including those in the office and with clients. If you set your phone to silent, or a single beep, for receiving text messages, you will also not annoy your colleagues. We all know someone who is addicted to texting and has their thumbs attached to their phone all time and having a little smirk when they receive one back. Do not be this person in your office – it is terribly annoying and you will not be taken seriously. By all means text if necessary – updating childcare arrangements or appointments, for example. It is even acceptable to write a sneaky text as long as your phone doesn’t beep with every letter pressed. You may be feeling as though your mobile phone allows you to be contactable all day at work by your family and friends. They wouldn’t necessarily call you on your office phone but are quite happy to text and phone your mobile. If this is beginning to be a problem in that you are not prepared to chat or text back in work time, you can either simply turn off your phone or educate your family and friends about how you feel. You could perhaps send them a link to this article. Why Do You Need to Make Personal Calls at Work? If you are looking for advice about making personal calls at work on your office phone, it is worth thinking about why you need to make calls. If you have a particular current issue that requires you to make calls, then go ahead. If you are regularly making long personal calls in work time and work resources, you are either lacking in motivation in your job or not respectful of the job you are there to do. 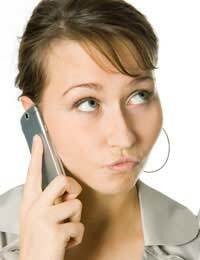 Even if you are not overheard, making regular personal calls will be noticed at some point, with your commitment possible brought into question. If you are making calls out of boredom, either look to change jobs or try to address your issues in the workplace. The reasons you need to make calls may be because you have a number of personal administrative issues that need dealing with, but your working hours make it impossible. If that is the case and you are finding that doctors, dentists and parents evenings are all building up, you may think to take a half day off to deal with your appointments or try to prioritise your workload so that you are better organised. This may be a manifestation of your hectic schedule, or an illustration that you could plan your time better.